On average, Australians plan to spend $955 over the holiday season. Most use savings for Christmas presents, but 46 per cent use the credit card, and another 4 per cent take out a loan. The average credit card debt after Christmas is $1,666. Most people will pay off their credit card debt within six months, but 18 per cent of Australians take a lot longer. Some will never pay off that debt. 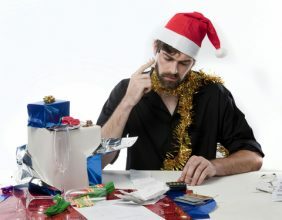 So, now the tinsel is packed away, and the Christmas dust has settled, how do you manage Christmas debt? Here, we share some handy hints for entering the new year on a lighter note. Look at how much you spent over the Christmas period. If you spent on credit, you need to think about the interest over that period and plan how quickly you can feasibly pay the debt. Break the debt into bite-sized chunks. For example, if your debt is close to the average $1,666, look at paying $100 off each week. Your debt will take about four months to pay off at this rate. And if you can comfortably pay off more each week? Great. Prioritise debts with higher interest rates, to bring your overall costs down. If you have more than one debt, you can talk to your Smartline Adviser about debt consolidation, which means combining more than one debt into a single loan. It can be easier dealing with one lender, and with your loans in one place, you have less paperwork. You also may have a lower interest rate, particularly if you are consolidating debts with your home loan. Be aware, though, that fees may apply. These include application fees and exit fees. There may be government taxes to pay. Be aware too that you are extending the lifetime of your loan. Repayments may be smaller, but you are paying for longer. Your Smartline Adviser will help you weigh up the pros and cons. January and February are good months for tightening the financial belt, and limiting your spending. Work out your weekly budget, and try and limit extra costs like meals out, or retail spending. Focus on paying back your debt as quickly as possible. And if all goes to plan, and your debt is paid off soon into the New Year? Consider putting money away in a high-interest savings account, so you can save for next year’s Christmas season. For more help regarding budgeting, check out our FREE downloadable Budget Planner. Or give us a call on (02) 8814 5275 to set up a meeting to discuss some Coaching options to help you get your finances in order the right way.